Annes hussain excellence of education is one of the best entry test preparation institute in Karachi city of Sindh. Anees Hussain College is wonderful past career about providing wonderful entry test preparation to the students of Karachi. Before Anees hussain classes was start in the month of 07 September 2018 now again new batch will be start soon, the schedule you can see below. 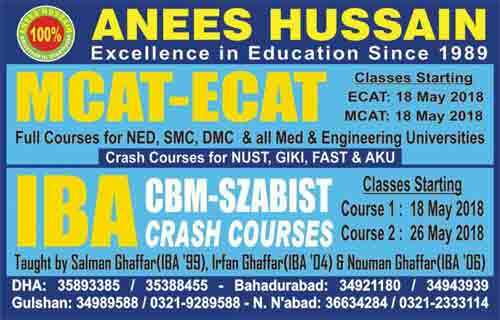 For best results you must join Anees hussain academy for wonderful results of MDCAT and ECAT entry tests. The crash courses for NUST, GIKI, FAST and AKU or UET you need to join Anees Hussain academy Karachi. ECAT starting new batch for karachi university chemical Engineering, Software Engineering, Computer Science, Discount fees limited seats. This institute is offering various entry test preparation courses for medical admissions, engineering admission, and other local admissions this is the complete list of Offered test preparation and international exams programs. . It also helps students by offering different international exam preparation courses like SAT, GMAT, IELTS, TOEFL, GRE and many others.